The dog isn’t referenced in the Bible in a very good way, as there are more than fifty verses describing dogs in a negative manner. That attitude goes for all canines: jackals, wolves, hyenas, etc. To the Hebrew people, canines were created to serve a particular purpose in God’s plan — they are the scavengers necessary to help clean up the environment, such as rotting carcasses and such. Ancient Hebrews, for the most part, did not have a culture which included animals as companions or pets, although other peoples around them did, such as the Egyptians. Different cultures, different likes, I guess. Today it is the same, because some modern cultures raise dogs as a food source, while other cultures, like ours, make dogs our friends or even treat them as family members. Humans have taken the dog and bred them into dozens of different types with different traits. Although dogs will still return to their vomit (Proverbs 26:11), they have, for the most part, been refined into a variety of loving creatures. Ask the plants of the earth, and they will teach you; and the fish of the sea will declare to you. 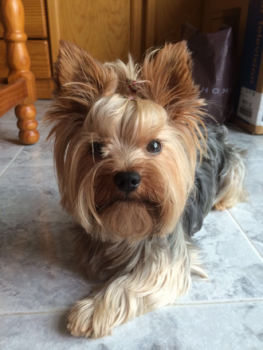 Our family — five of us — had always been drawn to the smaller breeds and for a long time, years ago, my wife Mary, bred and exhibited Yorkshire Terriers. The dogs did not live their entire lives being caged, like some breeders do, but had access to several rooms within our home, as well as access to a fenced yard, and played with our children, as well as with a great variety of toys. They were happy pets and they brought a lot of happiness to us. I often observed that the relationship we had with our pets echoed many similarities to our relationship with God. Our dogs depend upon us for their necessities, as we depend on God for ours. Our dogs depend upon us for protection from bad things, as we depend on God for ours. You get the idea. Anyway, just having these pets brings a lot of satisfaction to our own lives and I think God feels the same way about his people. 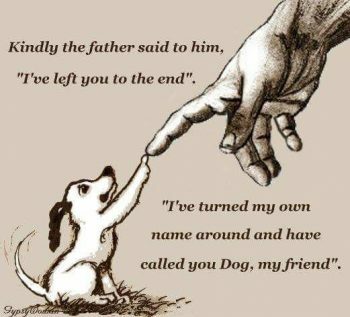 Just as God loves us, we love our furry family members. Twenty-two years ago, while thinking about Martin Luther’s quote (mentioned above), I wrote for my wife a light-hearted little poem about her love for Yorkies. A lot of Yorkie owners seemed to like it and asked if they could have a copy. I’ve made dozens over the years for friends and acquaintances. The poem has even been published in a dog magazine as well as on several online places. Here is what I wrote. For they could not have just evolved. And with a dog, that problem was solved. Living in Earth’s very first paradise? That small size and softness would be nice. For all the women that were to fill the Earth. Who sometimes spells LOVE as Y-O-R-K-I-E. I hope you are a pet owner. It matters not if it is a dog, cat, or some other animal. God put animals on earth for many reasons, some of which are for humankind’s enjoyment. Pets help you reduce stress, provide companionship, and give you entertainment. Pets teach you how to be responsible and compassionate. They can also sense and warn you of danger.6 Pets are wonderful creatures for a multitude of reasons. If you don’t now have a pet, I pray you get one soon. Zophar is one of the three friends of Job who visits to comfort him during his illness. Elwell, Walter A., (Ed. ), Baker Encyclopedia of the Bible, (Grand Rapids, MI: Baker Book House, 1988), vol. 1, p. 733. Seems like I remember seeing this poem some years ago, but can’t remember where. Are you the real author? Thank you for writing and asking this question. It is very possible you saw this poem years ago and yes, I am the author. I wrote it in 1996 while living in the same home I am in today. 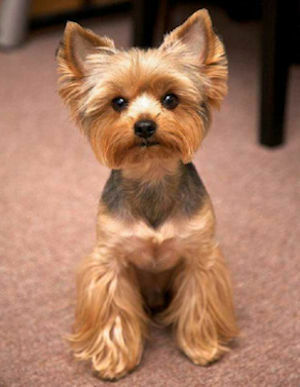 My wife used to raise and show these Yorkshire Terrier dogs, but does not do so any more. However, this copyright poem survives in many places, including forums and other web sites. The original copyright is held by me, ©1996, Ray Hermann. It has been published, as follows. (1) It was first published in print form in the January 1997 issue of The Yorkshire Terrier Magazine. (2) It was first published on-line at the poetry website, Acacia Vignettes, at https://acacia.pairsite.com/Acacia.Vignettes/Yorkies.In.The.Garden.html (3) The poem was produced as a commercially available mounted plaque by a doggy wood products company, between (about) 1998 and 2005 (the company does not sell these products any longer). I am not a pet owner so I’m very uncomfortable going to someone’s home and having their dog(s) bark at me, especially if I’m trying to carry on a conversation. It gets worse when the dog’s owner is yelling at the dog(s) to stop barking and some of them will “paddle” (hit) their “pet” trying to make them stop. This really annoys me. So far, I have noticed that if I sit down as soon as possible they quit barking. PS- That was a fantastic poem. Cute poem I bet your wife was proud of your poem. I have a small dog but not yorkie. Thanks for the comment. Yes, my wife was pleased.